The Romano-British villa at Butser Ancient Farm, completed in 2003, is a replica of one discovered at Sparsholt near Winchester and excavated in the late 1960’s (in the image above). We are now involved in installing a mosaic floor in the reception room, inspired by the splendid original – which resides in the Winchester Museum. Unlike the 4th Century, though, this mosaic isn’t being made by slaves. Instead a dedicated team of FABULOUS volunteers are on their hands and knees laying the new mosaic. The team includes volunteers from Liss Archaeology and Bignor Roman villa. While replica mosaics have been constructed in Britain and elsewhere across the Roman world (as well as many painstaking restorations of originals), we believe it is unusual for them to be laid by the ‘direct method’. That is, straight onto the floor. Most are laid on segments, sometimes later placed on a floor. The direct method is (as our crew will confirm) more physically demanding. 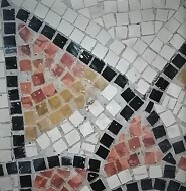 However, one of the main aims of recreating the mosaic is not just to take the Butser villa a step closer to the original but also get a sense of what working conditions were like for the makers of Roman-era mosaics; perhaps we can even foster a sense of empathy and camaraderie with the mosaicists of 1600 years ago. In an important way, our laying technique is experimental and experiential. The techniques we use to form the patterns of the mosaic and the materials used to bind them to the floor are also designed to further our knowledge. Lime mortar will be used in the mosaic construction. Unlike modern cement, this material is ‘faithful’ to Romano-British technique. Over the course of the project we will vary the types of lime and other ingredients in the mortar, to help us examine which mixes are optimal for both laying and durability. This floor, like its Sparsholt ancestor, is to be walked upon. Unlike its ancestor we expect tens of thousands of feet each year… hence our interest in durability! Progress proceeds apace on the mosaic. Arthur, Karen, Juliet, Emily, Maria, Jane, Jamie, Barbara, Julia, and Louisa did great work throughout the first week and we’ve finished the central 8-pointed star motif. Next we move on to three concentric circles – black, white, red. It should be a lot easier to lay than the central pattern, which proved unexpectedly difficult.. but it might be premature to say that :-). A great job was done and it looks fantastic – imagine what it will be like when we polish it!!! We are will be laying, measuring and planning the Greek Wave over the weekend!